Since 1989, Golden Axe in all its forms have filled our lives with hope and wonder. Who are the Death Adders in our lives? On who can we rely to vanquish our enemies? What kills with more expediency, an axe or a pitchfork? These are the questions that have perplexed our minds through the decades. In that time, Golden Axe went from the arcade to the home and back several times. Has Golden Axe seen its last hurrah? Will the Death Adder rise a final time from the ashes? We can only wait and see. Is your favorite game missing? Email here. 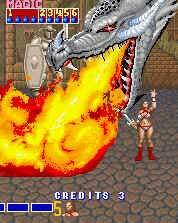 If you're interested, Ken Horowitz, from the site Sega-16 wrote a great history of Golden Axe. Be sure to check out his site for lots of other great history and memories of the great Sega systems of the past. Read an alternative Golden Axe history here.